November is Lung Cancer Awareness Month. The team at Pulmonary and Critical Care Services would like to take this opportunity to share some of the most recent data on screening and our own experiences thus far in 2018. As the leading cause of death among men and women, lung cancer remains the leading cause of all cancer deaths in the United States at 27 percent. More people die from lung cancer than of colon, breast, and prostate cancers combined. Nicotine abstinence has remained the main target for curtailing lung cancer incidence. Thanks to the high rate of cure if lung cancer is found in its earlier stages, the importance of screening for the disease cannot be overstated. The National Lung Screening Trial, which enrolled 53,454 current or former heavy smokers ages 55 to 74, showed a 15 to 20 percent lower risk of dying for patients who were screened with yearly CT chest imaging. Early results from the NELSON trial in Europe, a similar screening strategy of 15,792 participants, ages 50 to 74 with a history of cigarette smoking, showed a 26 percent decrease in mortality in high-risk men and a 61 percent decrease in high-risk women. Lung cancer screening programs aid with early detection of cancer, help patients navigate through medical care systems, and provide assistance with nicotine dependence. In the Capital Region, a lung cancer screening initiative started through the efforts of Dr. Dennis Rassias and a cadre of key physicians, including Dr. Kirsten Cestaro, is successfully growing and is now on its second year of existence. For the calendar year of 2017, our data showed that 572 patients were screened under the lung nodule program. Of those, 81 patients had a positive finding on CT chest imaging. The number of confirmed lung cancer patients was six. It is worth noting three deaths were not related to lung cancer. Our numbers suggest a lower incidence than the national average but we have attributed this to selection bias. There is a chance these numbers will change as we continue to screen wider populations. As of October 2018, more than 1,500 patients have been screened. As Pulmonary and Critical Care Services’ Lung Cancer Screening Program continues to grow, we are discovering new challenges but remain committed to support providers and patients with a vital service to the community. 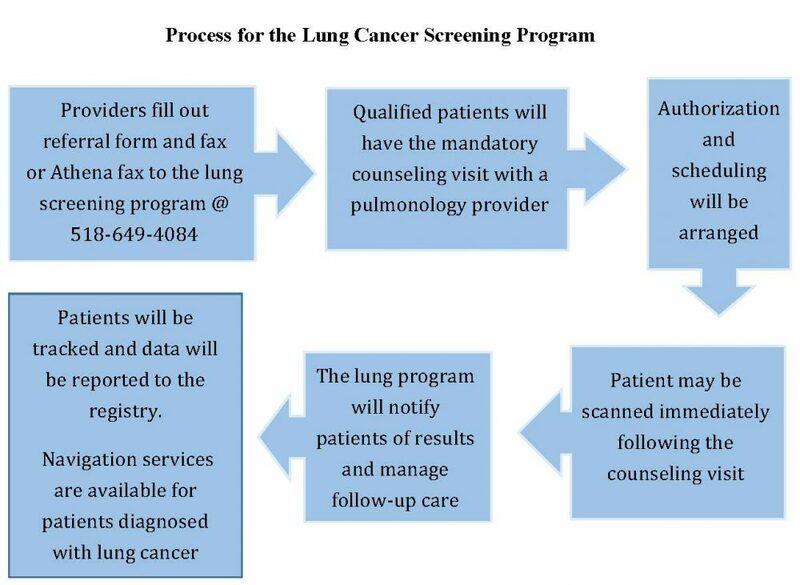 Facilitating this goal, we have simplified the lung screening process for health care providers. Based on similar Trinity lung cancer screening programs, screening will be by referral only. All required counseling visits, documentation, registry data collection, and ordering will be addressed by the Lung Cancer Screening Program. For additional information, please contact the Lung Cancer Screening Program at 518-687-9795.